Are you ready for 5 days of creators, functionality & more… and our next big release at the end? 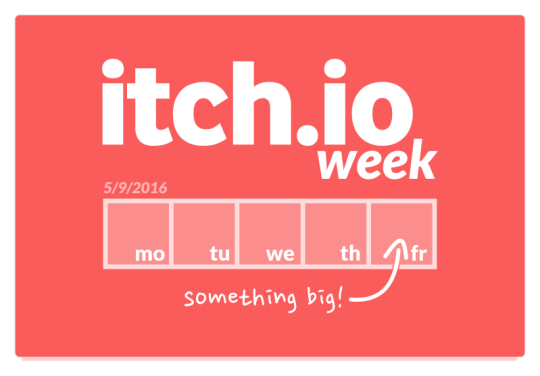 I hope so because starting May 9th (next Monday) we’re hosting our first itch.io week! itch.io week is an idea we’ve been cooking up for a while: we’ve got all these awesome creators and great tools… but it’s way too easy to miss them if you’re not refreshing us every day. We decided to spend an entire week celebrating what itch.io stands for and the people who use it. Each day we’ll have developer profiles with some of our favorite creators on the site (and links to where you can support them on itch.io) along with a focused feature. The focused feature will be some aspect of itch.io that we think is awesome. We’ll have a page (and blog post) dedicated to how you can use that feature, why it’s cool, and an upgrade for each one! Finally, on Friday, we’re officially launching our latest product. (You might already have an idea since we like to blab on Twitter). Anyway, we’re really excited. We’ve been working hard over the past few months to give independent creators the store they deserve, and the best technology to distribute their games.